The Gathering is the pilot movie for Babylon 5. It is sometimes numbered as the first episode, while other sources number Midnight on the Firing Line as Episode 1. It was originally broadcast on February 22, 1993. Twenty five years have elapsed for us since the sadly nostalgic, winebibbing Londo Mollari first announced the dawn of the Third Age. In doing so, the ambassador teased the sincerely though bombastically portrayed concepts that combined uniquely within Babylon 5 to brew a pop culture mythopoeia that – unlike other media franchises – also speaks strongly and immediately to the sociopolitical issues and power dynamics that that cause so much bitterness and strife in today’s society. A faithful representation of what was to come after it in the regular episodes, The Gathering reached far and wide – through worldbuilding to the synthesis of mythology, through eclectic genre conventions to hard science, through politics to contemporary social dynamics – in order to prepare an assembly of character and setting elements brimming with the potential to express camaraderie, mystery, and catharsis. If in 2018 the critic might dismiss this brew as being garish or stale, tasters with less discriminating tongues will find the well-aged blend an enriching and stimulating draught. Specifically, this blend of thematic source material revolves around a “who done it” plot that depicts the fear and distrust among different kinds of ordinary people trying to navigate society’s institutional structures. 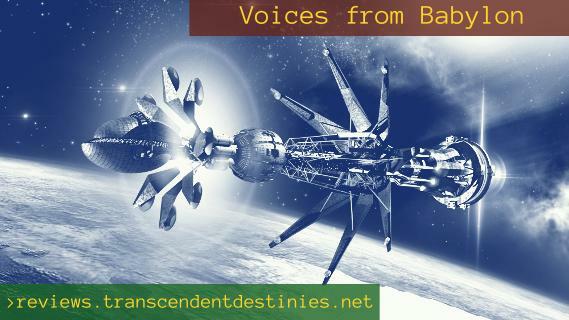 The setting and the namesake of the franchise is a distilled microcosm of contemporary society, its name – Babylon 5 – referencing the ancient city of exile, tyranny, and multicultural ambiguity in the Bible. Also serving as a public port for all kinds of purposes mundane and nefarious, the station’s primary purpose is to host some sort of ongoing “United Nations” peace conference between Earth and the other powers of the galaxy. (Dialog between two leading characters explicitly makes the comparison to “the UN on earth… Before it was dissolved.”) Despite the station’s high-minded pacifistic purpose, the gathering is broken before it is fully assembled, when an unknown assasin poisons and nearly kills the ambassador from the most enigmatic and powerful alien civilization, the Vorlon Empire. The opening act depicts the station’s ranking officer Commander Jeffrey Sinclair showing around the newly arrived crew member Lyta Alexander, while Executive Officer Laurel Takashima and the nameless, traditionally uniformed personnel in Babylon Control build up the significance of the impending arrival of the Vorlon ambassador. When Ambassador Kosh does arrive – early, catching the eclectic little station off guard – he is immediately set up as a dying god. The mysterious representative from an indeterminately powerful civilization – veiled from human sight by a full body suit that can only be concealing a very alien form – is shown stepping off his ship and into the chamber where the other ambassadors were supposed to greet him; and then the next thing we know, he is lying belly-up on the floor like some discarded plastic action figure. This is a fascinating stroke of both plotting and characterization. Perhaps the most immediately practical consequence is that it allows us to sympathize with Kosh – a character that is not portrayed by an actor but is basically a mechanical puppet. Asking the audience to buy in to Kosh as a serious, semi-mythological figure of indeterminate powers might have been a hard sell, but both his believability as a character capable of audience empathy and eventually his seriousness as a powerful being in the show’s legendarium are carefully shielded by The Gathering‘s calculated pacing. We see Kosh get out of his ship, and before we can move from feelings of alienness and weirdness to thinking that it might all be a bit ridiculous, we see him lying ridiculously on the floor. But then we hear that he has been poisoned in an attempted assassination, and the ridiculousness turns to pity. We can’t be laughing at the posture of a murder victim. The unfolding plot relies on the rigidly followed convention of dutiful officers breaking the rules in order to do the right thing, being willing to take “full responsibility” for their actions in dignified professional sacrifice. Familiar from about one out of every two Star Trek episodes ever made, this convention serves little more than to move the plot forward, or perhaps also to establish a few genre and character expectations. Ultimately, Babylon 5 does share with Star Trek some of the imagery of the dutiful, virtuous human space officer as the exemplorary progressive human. As a massive generalization with notable counter-points in both cases, both of these space opera franchises are optimistic and progressive. However, Babylon 5 does not follow Star Trek in identifying progress with utopianism or materialism. Where Star Trek is utopian, Babylon 5 is transcendental. Here in The Gathering, this different emphasis on humanistic progress manifests in the political realism. Babylon 5 is all about politics; interstellar politics is the whole reason the station exists, and the show extends the political interconnectedness through its depiction of its characters’ relationships to each other through their institutions. More than in most other science fiction television – easily more than in Babylon 5‘s obvious genre predecessors – politics is brutally personal. In one scene, a politician speaking by video conference to Commander Sinclair asks who is in charge of the investigation regarding the apparent assassination attempt, and then bluntly questions Security Chief Michael Garibaldi’s competence in light of Garibaldi’s past professional failures. Garibaldi was in the room for that conversation, setting up the sense of social fear fueled by political anxiety that carries The Gathering. Garibaldi serves as an example of a mediocre, mid-level institutional man who knows, and in Garibaldi’s case has humbly accepted, that he doesn’t deserve his position. Our guide through this familiarly alien future of politics colliding with social and professional strife is the business casual newcomer Lyta Alexander. Or, more accurately, our guide is Commander Sinclair as he shows Lyta around the station; for we are Lyta Alexander. Her portrayal by Patricia Tallman suggests an average, generically Western professional woman from the ‘90s. Her occasionally sarcastic, often disconcerted manner is possibly the best acting in the movie (though maybe the differently theatrical performances of Peter Jurasik as Londo and Andreas Katsulas as G’Kar would compete). All of this makes Lyta an ideal audience representative, our questions in her mouth as we along with her are instructed in the ways and circumstances of Babylon 5. But Lyta is a telepath. Having the audience stand-in character embody the aspect of the worldbuilding that is potentially the most difficult to buy into is a stroke of both wish-fulfillment and plot development that balances the eclectic mix of genre elements. As science fiction, Babylon 5 defies simple classification on the “hard” to “soft” scale of scientific accuracy and realistic future possibility. A “hard” realism comes from showing artificial gravity to be produced by the centrifugal force of a rotating hull, for instance. Telepathy is one of the “soft” elements, working along with the cyberpunk gadgetry to produce the comic book vibe that forms one part of the aesthetic. Here, Lyta’s telepathy reinforces her outsider status while serving as a metaphor for empathy. This alien, preternatural, involuntary empathy of Lyta’s helps to establish the parallels between her role in the plot and the social plight of women navigating the politics of the today’s workplace. In one scene, Lyta mediates a business transaction and then is belligerently confronted by the businessman whose dishonesty she exposed. “Someday I’m going to find the guy who thought up the idea of renting telepaths to businessmen, and I’m going to kill him,” the man says to Lyta. Here the analogies are clear – the institutional telepath of Babylon 5‘s future is treated like property, playing a mechanical role on the sidelines of business proceedings while not being consulted on her ideas or opinions. The telepath is special in an uncomfortable alien way, expected to be aloof and to quietly serve her purpose. Today, the imagery of the heavyset old man in a suit angrily confronting the young professional woman evokes the headlines about powerful, institutionally entrenched men abusing women who have no recourse in the system for justice. The analogy is almost explicitly extended to encompass sexual harassment when the very next sequence – taking place immediately after her meeting with the businessmen – shows Lyta being sexually propositioned by the Narn ambassador G’Kar. The nastiness of G’Kar’s supposed alien naivete might seem like part of the analogy, but really it feels like little more than a cheap laugh at Lyta’s discomfort. The Gathering gets more interpretive mileage out of the drama of conflicting duties, which the contemporary political themes makes easily accessible for application. One of those conflicts is between Lyta and Sinclair – between the audience stand-in and the protagonist, between the learner and the mentor. Lyta’s reaction of horror and revulsion when she must implicate Sinclair suggests that this could be another point in the analogy of women’s professional struggles, another example of a corrupt man entrenched in the unjust system. But we’re never allowed to begin to suppose that Sinclair might really have done it. Perhaps here The Gathering shows that it is a product of a different time. With the rapidly sidelined exception of Lyta, none of the station staff ever really consider that their Commander could be guilty. Today’s darker storytelling seems to take interpersonal distrust and suspicion for granted, but Babylon 5 reflects an assumption that protagonists and sidekicks are at least productively moving together as a team. The threat of the dissolution of that team establishes the second social metaphor – the plight of the institutional man, the man whom the institution can throw away unjustly, the man afraid of being falsely accused in an atmosphere of suspicion. Sinclair faces the ultimate fear from this perspective – a fear much deeper than of losing a job – the fear of being exiled, of losing all one’s friends, of being cut off forever from the people who would love you. As Sinclair faces potential extradition to the Vorlons for judgment, the real assasin lurks anonymously between a gadget that can mask the user’s appearance by adopting the likeness of someone else. And who is the shapeshifter? Whomever it may be, it seems to have a fondness for appearing in the guise of anonymous men who don’t stand out from the crowd. The shapeshifter is the ordinary unsuccessful man, the untrustworthy stranger or the cog in the machine. As someone who could be anyone but is no one, the shapeshifter represents the restless misery of the disenfranchised younger man, the man choking on his own social uselessness, who comes to believe that he can do nothing other than hurt others and sow more conflict. But of course, a shapeshifter could be anyone. In the scene where the shapeshifter wears Lyta’s appearance and then comes face to face with her, the real Lyta’s expression of horror seems like an unfair chastisement for her indictment of Sinclair, as if the show were retorting, “See? Just because it looks like someone doesn’t mean it’s really them!” That tonal miscalculation aside, the moment helps build the present analogy. Ultimately, the shapeshifter is neither a bitter disenfranchised white man nor a socially suppressed professional woman. The shapeshifter is Minbari, a member of an ancient and proud people that was once determined to annihilate humanity but then relented in favor of peace. Meanwhile, the Minabari ambassador Delenn offers overtures of peace laced with implications regarding the mythological plotlines of the future series. Delenn serves alongside Centauri ambassador Londo Mollari as the two prophets of the mythology. The Centauri primarily serve as a mirror for humans. Their Republic is a degenerate civilization fallen from its past might and glory, while Earth Alliance becomes increasingly powerful as humanity rides the tidal wave of progress after learning that there are other sentient peoples in the galaxy. The Minbari have a more direct meaning as part of the broader political analogy. Delenn is introduced nearby a Japanese rock garden. The Minbari as Eastern civilization will become a recurring analogy, but the establishment of the analogy here in The Garden mostly reinforces the pattern of vindictive social anger. This tangle of social and political violence interwoven between the different levels of the story is one of the strengths of Bablyon 5, and The Gathering exemplifies it in approximately normal quality – neither the franchise nor episodic science fiction storytelling at its best. Better and more unique is the way that Babylon 5 weaves a comprehensive internal mythology that descends through the intrigue of the political backstory to relate to a cast of characters at once ordinary and alien. Here, this incarnation of the transcendent myth is best expressed by Doctor Benjamin Kyle – a gentle character depicted as a wise man archetype – who describes interacting with his mysterious patient as a moment “when everything crystallizes, and the whole world reshapes itself… and nothing is the same anymore.” Here in the pilot film, we are already staring backward at the legacies of decadent civilizations and hearing the evening lament of ancient races diminishing into the twilight as younger kindreds with incompatible destinies rise to replace them. More uniquely and more importantly, we are already seeing the mostly wooden characters find deeper dimensions of themselves by interacting with living mythologies present in the setting and in the chaotic disorder of the unfolding politics. The core group of characters comprising the alien ambassadors and the human station crew does has not yet reached its fluctuating dynamic. The camaraderie of the protagonists is still painted on, faking it until they eventually will attain more authentic communion. The ensemble has yet to become a fellowship. Three of the primary characters of The Gathering will not return for the first standard episode Midnight on the Firing Line. One of those will yet be involved in the rebirth of the mysteries merely suggested here. One will be replaced, but the mythologies do not forget. So, join me, drifters and officers, outlaws and politicians, strangers and aliens. Let’s raise a glass to our collective social bitterness, to our fears of being cast away alone, to our myriad strivings against or within the system, each perspective alien to each. Here’s to the mystery lurking unseen around us and among us, to solace glimpsed in the face of the dying god. One thing is absolutely certain. This cup will not pass from us until we drink it down to the dregs. The main textual content published on this page,“Voices from Babylon: Into One Cup,” by Strivenword is licensed under a Creative Commons Attribution 4.0 International License. Stock image from Bigstock. Design by Strivenword.